Hillary Clinton didn't campaign in Kansas. 427,005 people voted for her there anyway (36%). She won the Kansas City area-- Douglas County 31,195 (62.28%) to 14,688 (29.32%) and Wyandotte County 30,146 (61.80%) to 15,806 (32.40%) in landslides and did well enough in Johnson and Shawnee, respectively 129,852 (44.76%) to 137,490 (47.40%) and 33,926 (44.99%) to 35,934 (47.65%). She took the 3rd congressional district up there 47-46%. Sedgwick County (Wichita) was a bummer for her though-- 69,627 (36.88%) to 104,353 (55.28%). For whatever reasons, Clinton wasn't a popular political figure in Kansas. The state primary caucuses saws Bernie beat her in every district and his statewide total was an astonishing 67.7% to 32.3%. Bernie is very popular in Kansas. Who'da thunk? The Republican wing of the Democratic Party-- the corporatists-- had a convention last week in Columbus Ohio to plot out a way to prevent Bernie and Elizabeth Warren from winning the 2020 presidential nomination. The same wing of the party and their media shills have been spending more time smearing Alexandria Ocasio than on defeating Mitch McConnell and Paul Ryan since she defeated one of their own, corrupt New Dem powerhouse Joe Crowley, a few weeks ago in a primary. Bernie and Alexandria were in Kansas City and Wichita Friday, campaigning for progressives Brent Wilders and James Thompson. Reporting for The Intercept yesterday, Briahna Gray wrote that "the gestalt of the day’s remarks was something bigger than any one race. The speeches-- particularly Sanders’-- announced a unifying theme that felt too coherent to have been thrown together for a House primary or two. Individually, the remarks were compelling. Together, they comprised an unabashed declaration of post-partisan movement building-- a rebuke to those in power who fetishize every identity-based division in order to diffuse the largest coalition in the country: the working class." In the 3rd district (Kansas City), Welder has a primary from a heavy-funded EMILY's List moderate and some very right-wing Democrat coming up before he can get to Trump rubber-stamp Republican Kevin Yoder. In the 4th district (Wichita), "Thompson is an even better opportunity to prove the Sanders and Ocasio-Cortez case. Thompson is looking to fill the Wichita seat-- home of Koch Industries-- once held by CIA Director Mike Pompeo. Thompson made waves last year when he came close to defeating Republican Ron Estes in a special election in a solidly red district, falling seven points short ahead of this year’s rematch. A civil rights attorney with no prior electoral experience, his near-win is evidence, to some, that Sanders’s platform is as pragmatic as it is progressive. “They say we should be more centrist,” Thompson said to supportive boos before arguing that if Kansans wanted a moderate, or a 'Republican-lite,' they would’ve voted for Clinton in 2016." Where electoral battles have long been viewed as a struggle over red states and blue states-- an effort to dominate the map like advancing armies, on Friday, that partisan dichotomy was evoked only to be dismissed in favor of a narrative that highlights the universal struggles shared by residents in locales as diverse as Kansas and Vermont and the Bronx. Yes: Trump is a racist. Critiques of his immigration policy and calls for criminal justice reform received enthusiastic applause. And yes: Kansas went red in 2016. But Sanders, Ocasio-Cortez, and Thompson each emphasized that the enemy was not a color-- not red or blue, nor black or white. It was the 1 percent, people like the three families who, as Sanders pointed out, have more wealth than the bottom half of Americans. Where there are working-class people, exhorted Ocasio-Cortez, there is hope for the progressive movement. Later, Thompson echoed that sentiment. It’s not about Republicans or Democrats, he said, but about working people coming together. "Clinton wasn't a popular political figure in Kansas." Or Ohio, or Michigan, or Wisconsin, or Minnesota, or Missouri, or Maine, or New Hampshire. But, somehow, the Russians stole her coronation. LOL. Can't wait to see what the excuse is in 2020 when the Russians, or Chinese, or the Senagalese steal Cory Booker-Joe Biden-Kamala Harris' election when the Dems try to run another corporatist. I disagree, 8:01. Trump likes the Congress the way it is and will come up with a national security reason to postpone the election indefinitely. "I disagree, 8:01. Trump likes the Congress the way it is and will come up with a national security reason to postpone the election indefinitely." Right after he names Putin his vice-president I presume? I've never seen so much Trump Derangement Syndrome in my life as on this site. You act like a bunch of powerless wimps, crying about Putin and Facebook and phony fascism. If you don't like the election results, stop supporting kickback artists and criminals as head of the Democratic Party. Do you really think that that warmonger was the "lesser of two evils" in 2016? Putin doesn't play 2nd fiddle anymore, 11:53. It's a good thing you do, or Trump wouldn't have many defenders on this site. Party members and fundraisers gathered for an invitation-only event to figure out how to counteract the rising progressive movement. 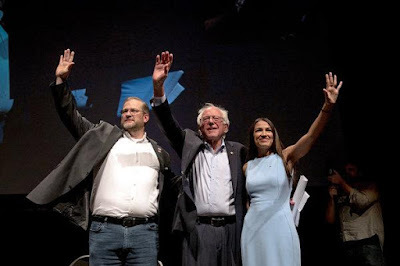 "...the first-ever "Opportunity 2020" convention, organized here last week by Third Way, a moderate Democratic think tank, gave middle-of-the-road party members a safe space to come together and voice their concerns." "The only narrative that has been articulated in the Democratic Party over the past two years is the one from the left," former Delaware Gov. Jack Markell told NBC News. "Where progressives see a rare opportunity to capitalize on an energized Democratic base, moderates see a better chance to win over Republicans turned off by Trump." Are you SURE that this is the Party you want to reclaim from within? It looks to me like you are already not going to be allowed to do so. 3:40, as we've seen since the '80s, the only elections that the democraps can win are ones that occur after particularly awful R admins or economic distress. Clinton won only because of a mild recession and the split of the Nazi vote between the R and ross perot. after cheney/bush started wars and tortured and, most important, Lehman cratered causing the start of the 2008 crash JUST BEFORE THE ELECTION, we got obamanation. But obamanation and his bunch refused to fix anything at all, so first congress flipped and then the white house. Is trump and his crew horrible enough to cause another anti-red wave? probably. but we're at a point now where we KNOW the democraps have nothing and will do nothing for voters. So it will take not long at all for the whiplash effect again and we'll get worse than trump very soon after this anti-red wave. Unless trump just does away with elections. Who would stop him? voters? congress? the military? I'm laughing. All he needs to do is tweet "fixed" or start a war with Iran. But he'd just as likely start a war with Canada.